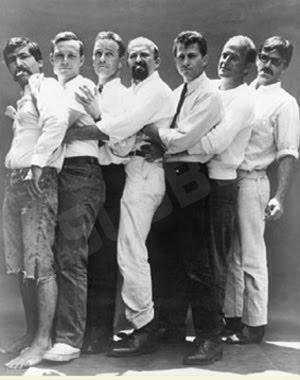 The Ferus Gang (Group Portrait of Artists from the Ferus Gallery), 1962. (Left to Right: John Altoon, Craig Kauffman, Allen Lynch, Ed Kienholz, Ed Moses, Robert Irwin, Billy Al Bengston). Photo by Patricia Faure.